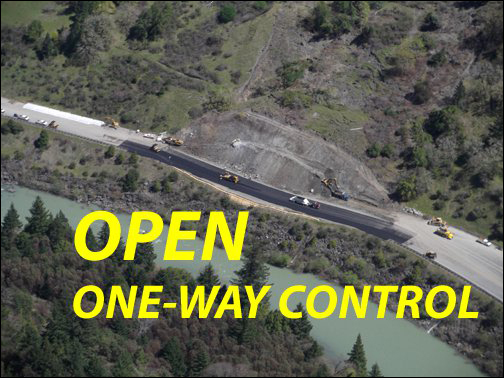 Highway 101 open to one way controlled traffic as of 2am Monday!!! per Caltrans press release. Eureka – Caltrans is pleased to announce that Route 101 in Southern Humboldt County will reopen to one-way controlled traffic at 2:00 AM on Monday, April 4. Motorists should expect 30-minute delays. No further closures will occur unless significant slide activity resumes. Crews continue to work 24 hours a day to complete slide removal, repair the roadway, and monitor the slide. The highway was closed on Wednesday morning due to a large mudslide approximately one mile north of Dean Creek, approximately 60 miles south of Eureka. Caltrans will issue another update by noon on Monday, April 4. This entry was posted in Roads and tagged 101, CalTrans, mudslide, photos, slide. Bookmark the permalink.